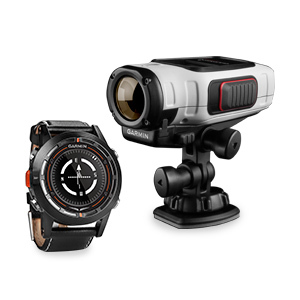 The ultimate in portable wrist-worn GPS flight navigation meets the freedom to record and enjoy all your aerial adventures in crisp HD video with this comprehensive Action Pack that includes the VIRB Elite Aviation Bundle and D2 pilot watch. The compact VIRB Elite camera mounts easily in your aircraft, providing digital image stabilization, a WideVü lens, prop filter, crisp 1.4-inch Garmin Chroma Display™, and up to 3 hours of recording time at 1080p. Plus, wireless connectivity lets you start/stop recording, capture still shots, view elapsed time and other functions using your Garmin D2 pilot watch as a convenient wireless remote.